A can a day for every 20 lbs. of. body weight. Adjust Feeding Levels to your dog’s individual needs. Puppies and nursing dogs may require two to three times the amount normally fed. Offered in a multitude of colors and styles, Scott Pet has a collar for every need. Available in a variety of lengths and widths, and with traditional and quick release buckles. Your dog shows his real love in endless ways. And you show your real love for him with real, tasty food. 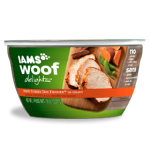 Iams® Woof Delights Happy Turkey Day Dinner is a wet dog food made with delicious, protein-packed ingredients such as lean meat and eggs. With no gluten or artificial flavors, it’s the real, tasty way to keep love strong. Made in the USA, True Chews® Premium Jerky Cuts™ are a 100% natural, high protein treat your dog will love. Our American-sourced, American-made real chicken jerky tenders are rawhide-free and contain no artificial flavors or fillers. They’re a naturally delicious dog treat you can feel good about giving. Your dog will thank you! Dogs love the taste of chicken. With real chicken as a key ingredient, your dog will indulge in every bite, down to the last lick of the bowl. Not only is the real chicken tasty, it serves as a high-quality protein to help your dog build and maintain healthy muscles. Rice is a quality carbohydrate source to help your dog maintain a healthy energy level. Natural with added vitamins and minerals, you can feel confident your dog is receiving the premium nutrition that’s a pillar of the Eukanuba philosophy. Beneful wet dog food is made with wholesome ingredients you can see and delicious flavors your buddy is sure to love. Available in seventeen wholesome varieties to help keep him happy and healthy. Iams Savory Sauce is a healthy way to top dry dog food for mealtime variety. When poured over a high-quality dog food such as Iams, Iams Savory Sauce adds essential vitamins, minerals and antioxidants to a complete and balanced meal. Roasted Beef Flavor contains real beef broth and meat for a savory taste dogs crave. Every bottle also contains real peas and carrots for added flavor and nutrients. Beet pulp aids with healthy digestion. All flavors are low in fat and calories. 85% Portein 15% Good Stuff. It's a snap to give him a treat any time. It's a snap to share the meaty taste he loves. It's a snap to treat him to a little variety. It's a snap to make his day. We make Beneful dog food to feed the need to play. That’s why we make it with fun colors, shapes, textures and flavors, along with wholesome ingredients and balanced nutrition.